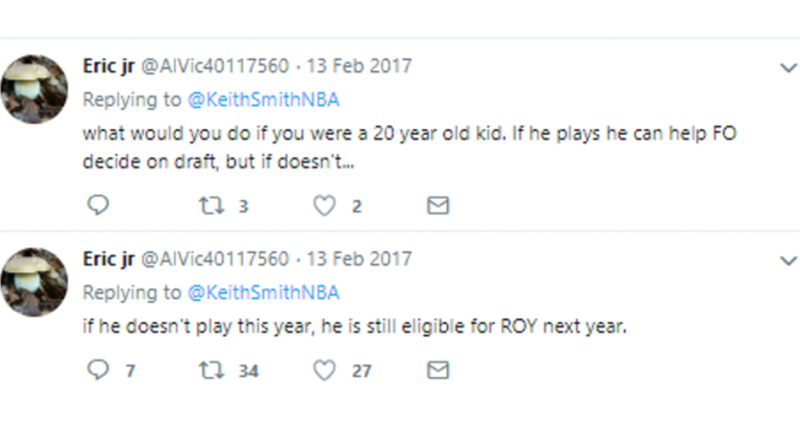 A Colangelo-linked burner suggested in February 2017 Simmons was maintaining RoY eligibility by not playing. Monday’s NBA Awards have had a lot going on, but one of the most-discussed developments comes from the Philadelphia 76ers’ Ben Simmons winning Rookie of the Year. Simmons was drafted in 2016, but didn’t play at all that year after fracturing a bone in his foot in a September practice and being ruled out for the rest of the season in February. Simmons had an excellent 2017-18 campaign, averaging 15.8 points, 8.2 assists and 8.1 rebounds per game, and was named Rookie of the Year as a result, but there was some controversy there, and incredibly, some of it comes from one of the burner Twitter accounts linked to former 76ers GM Bryan Colangelo. if he doesn't play this year, he is still eligible for ROY next year. This tweet hasn’t received as much attention as many of the others “Eric jr” sent around that time, as that was the height of the account’s criticisms of Joel Embiid and suggestions that Jahlil Okafor had (then-undisclosed) knee problems. Both of those are bigger issues in retrospect. And there was no reason for anyone to pay attention to this tweet from a random user with a few followers back then. But in light of those accounts being linked to Colangelo (or, as he claimed, his wife, without his knowledge), that’s a whole lot more interesting. Of course, that tweet is far from proof that the Sixers’ organization or Simmons himself held him out to preserve RoY eligibility, especially if it was truly the telephone tag of Colangelo’s wife relaying something she heard from him and especially considering that a medical exam after this led to Simmons being shut down for the year. And even if this was all some grand conspiracy, that wouldn’t affect Simmons’ eligibility under the NBA’s current rules, and it wouldn’t change the RoY outcome. But it’s absolutely hilarious that a Colangelo-linked burner suggested this way back when.